2. Land areas in Early Ordovician Period, Paleozoic Era, 480 mya, when the Avalonia terrane (A), harboring ancestral millipeds, rifted from Gondwana (G) and began drifting toward Baltica (B), shown by bold arrow. Ancestral populations were thereby partitioned between Avalonia and Gondwana. Dispersions and evolution continued in Gondwana (light arrows), but other land masses were devoid of millipeds. EVENTS AND APPROXIMATE DATES IN EARLY DIPLOPOD EVOLUTION (adapted from Shelley & Golovatch, 2011, Insecta Mundi 0158, Table 6, pp. 116-120). 1. (Diagram 1). 524 ma (million years ago). Paleozoic Era, Mid-Cambrian Period. Evolution begins as ancestral form(s) crawl onto still attached Avalonia Terrain, disperse onto Gondwana proper, and radiate explosively into empty terrestrial environments in absence of predators and with all niches vacant and unoccupied. 2. 524-480 ma. Paleozoic, Mid-Cambrian-Early Ordovician. Penicillata/Chilognatha, Pentazonia/Helminthomorpha, Colobognatha/Eugnatha, Julida/ Nematophora/Merocheta diverge. Polyxenida, Polyzoniida, Siphonocryptida, Spirostreptida s. l./Cambalidea, Chordeumatida, Siphoniulida, and Polydesmida arise and spread between Avalonia and Gondwana proper. 3. (Diagram 2). 480 ma. Paleozoic, Early Ordovician. Ancestral populations of Pentazonia, Colobognatha, Eugnatha, Nematophora, and the existing orders Polyxenida, Polyzoniida, Siphonocryptida, Spirostreptida s. l./ Cambalidea, Chordeumatida, Siphoniulida, and Polydesmida are partitioned between Avalonia & Gondwana as Avalonia rifts from latter and begins drifting towards Baltica. 4. 480-450 ma. Paleozoic, Ordovician. Glomeridesmida, Sphaerotheriida, Siphonophorida, Spirobolida, Epinannolenidea, Spirostreptidea, Stemmiulida arise and disperse on Gondwana; partitioned Gondwanan populations of Polyxenida, Polyzoniida, Siphonocryptida, Cambalidea, Chordeumatida, Siphoniulida, Polydesmida evolve and disperse farther as Avalonia drifts northward towards Baltica; probably little to no divergence, dispersal, or advancement among partitioned populations confined to Avalonia due to its relatively small size and limited number of niches. 5. (Diagram 3). 450 ma. Paleozoic, Late Ordovician. As land masses collide, forms confined to Avalonia for 30 my disperse onto Baltica and radiate explosively into its empty terrestrial environments with all niches vacant; probable burst of evolution and origins of orders Glomerida, Platydesmida, Julida, Callipodida; divergences and dispersals continue among forms remaining on Gondwana. 6. (Diagram 4). 440 ma. Paleozoic, Early Silurian. As land masses collide to form Euramerica, forms on Baltica + Avalonia disperse onto Laurentia, again radiating explosively into its empty terrestrial environments with all niches vacant; probable second burst of evolution further differentiating Glomerida, Platydesmida, Julida, Callipodida, and possibly Cambalidea and Polydesmida; divergences and dispersals continue among forms remaining on Gondwana. 7. 415 ma. Paleozoic, Late Silurian. Spirobolidan population on Gondwana partitioned as North China terrane rifts from proto-Australia region and begins northward transit to Siberia (+ Kazakhstania); forms on Euramerica differentiate and disperse farther into it, Archidesmus macnioli fossilized in Proto-Scotland; divergences and dispersals continue among forms remaining on Gondwana. 8. 400 ma. Paleozoic Era, Early Devonian Period. Forms on Gondwana further partitioned as South China and Southeast Asia terranes rift from proto-Australia region and begin northward transits to Siberia (+ Kazakhstania); spirobolidans on drifting North China terrane continue passive transit northward; divergences and dispersals continue among forms on Euramerica and those remaining on Gondwana. 9. 356 ma. Paleozoic, Early Carboniferous. After collision, forms on Euramerica spread into Siberia + Kazakhstania, which merged Late Devonian (370 ma). Spirobolidans on North China terrane and forms on South China and Southeast Asia terranes continue passive transits northward. Dispersals continue among forms remaining on Euramerica and Gondwana. 10. (Diagram 5). 306 ma. Paleozoic, Late Carboniferous. Collision of Euramerica + Siberia + Kazakhstania with proto-South America/Africa part of Gondwana, forming West Pangaea, allows separately evolving northern and southern diplopod faunas to mix for first time. Proto-South American forms of Glomeridesmida, Siphonophorida, Spirobolida, Spirostreptidea, Stemmiulida spread directly into proto-Mexico and then into proto-southwestern US. US/Illinois oniscomorph pentazonian fossilizes. Spirobolidans on North China terrane and forms on South China and Southeast Asia terranes continue passive transits northward. Dispersals continue among forms remaining on Euramerica and Gondwana. OO. The micro-continents Baltica (B) and Laurentia (L) that lay in the Iapetus Ocean north of Gondwana in the Cambro-Ordovician Periods, with positions of present-day European countries and US & Canadian states/provinces. Solid interior lines represent coast lines at this time with the areas inside being above sea level; lighter outside lines represent margins of continental shelves. Triangle, future location of the Scottish Helminthomorph Silurian fossil (uncertain order), Archidesmus macnioli; Star, future location of the non-spinose oniscomorph pentazonian Carboniferous fossil in Illinois, USA. 3. 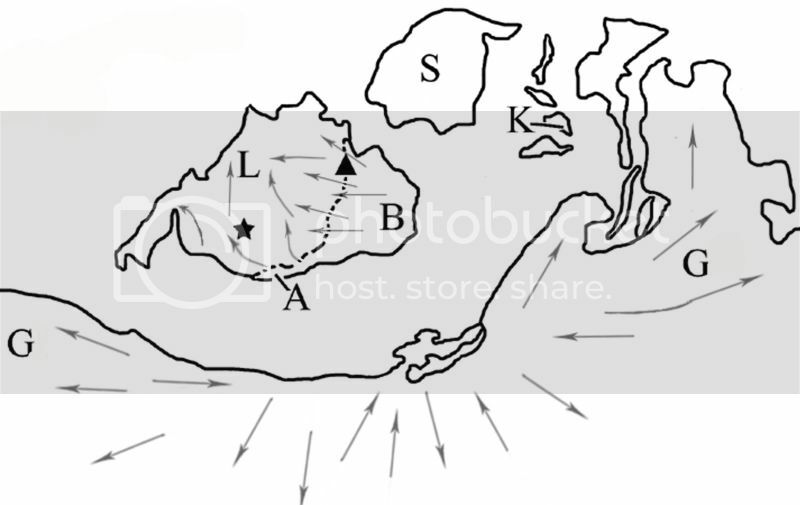 Land areas in Late Ordovician Period, Paleozoic Era, 450 mya, when Avalonia (A) merged with Baltica (B), thereby allowing the ferried populations to disperse into Baltica, which did not then harbor millipeds. Dispersions and evolution continued on Gondwana (G), while other land masses were devoid of millipeds. Separate "northern" and "southern" diplopod faunas thus originated that were effectively evolving in "parallel." 5. 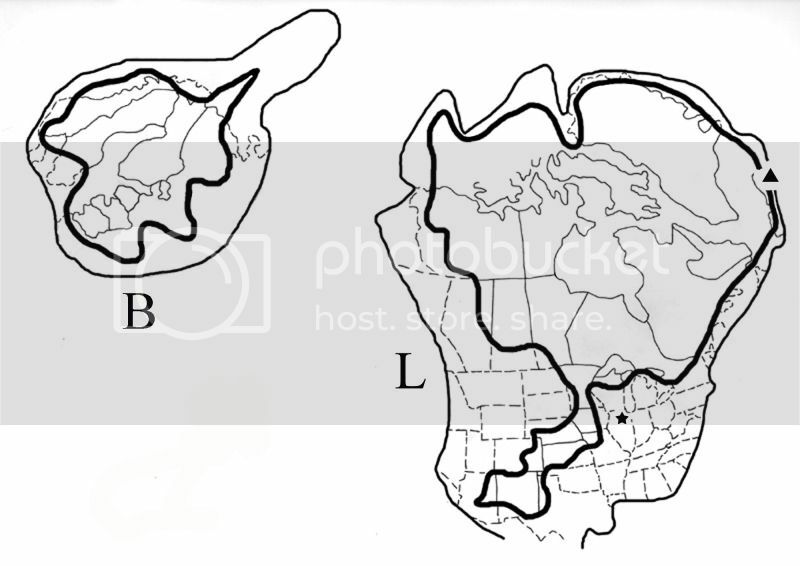 Land Masses in Late Carboniferous Period, Paleozoic Era, 306 mya, after Siberia (S) + Kazakhstania (K) had merged with each other and the Baltica (B) part of Euramerica, which had also merged with the proto-South America/Africa part of Gondwana. The arrows denote dispersals from Baltica into Siberia + Kazakhstania and mutual dispersals and faunal exchanges between Euramerica and the SA/Af part of Gondwana (G); for the first time, the separately evolving northern and southern diplopod faunas were able to mix. By this time, dispersals had extended throughout Gondwana, and all land masses contained millipeds. The North China (NC) and South China (SC) terranes had rifted from the proto-Australia part of Gondwana and were ferrying gondwanan millipeds to what is now eastern and southeastern Asia. Inverted Triangle, approximate location of Gobiulus sabulosus, the Mongolian Cretaceous spirobolidan fossil. 11. 270 ma. Paleozoic, Early Permian. Continued northward dispersals by Glomeridesmida, Siphonophorida, Spirobolida, Spirostreptidea, Stemmiulida in proto-Mexico/proto-southwest US part of West Pangaea. Spirobolidans on North China terrane and forms on South China and Southeast Asia terranes continue passive transits northward. Dispersals continue among forms remaining on West Pangaea and Gondwana. 12. 255 ma. Paleozoic, Late Permian. After collision, Spirobolidans on North China terrane spread into Siberia + Kazakhstania part of West Pangaea. Forms on South China and Southeast Asia terranes continue passive transits northward. Continued north/south dispersals in Mexican part of West Pangaea; continued dispersals in rest of West Pangaea and Gondwana. 13. 250 ma. Mesozoic Era, Early Triassic Period. Glomerida, Platydesmida, Julida, Callipodida begin dispersing east-southeastward along southern margin of East Pangaea. Forms on South China and Southeast Asia terranes continue passive transits northward. Continued north/south dispersals in Mexican part of West Pangaea and continued dispersals in rest of West Pangaea and Gondwana. 14. 220 ma. Mesozoic, Late Triassic. After collision, Gondwanan forms on South China terrane spread into East Pangaea and mix with Euramerican forms on latter, which spread into merged terrane. Continued dispersals in all directions in West Pangaea. 15. 195 ma. Mesozoic, Early Jurassic. Pangaea now fully assembled. 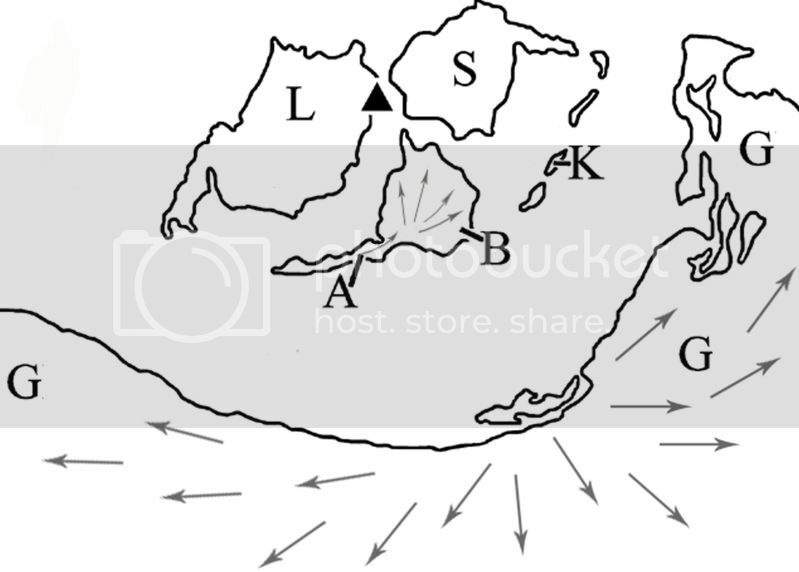 After collisions, Gondwanan forms on Southeast Asia terranes spread into East Pangaea and mix with Euramerican forms on latter that spread onto merged terranes. Continued dispersals in all directions in West Pangaea. 16. 152 ma. Mesozoic, Late Jurassic. Pangaea rifts into Laurasia + a new and somewhat differently constituted Gondwana. Proto-Mexican forms of Glomeridesmida, Siphonophorida, Spirobolida, Spirostreptidea, Stemmiulida disperse southward into proto-Central America that begins forming on southern border of proto-Mexico. 1. Land areas in the Mid-Cambrian Period, Paleozoic Era. Bold arrow represents emergence, around 524 mya, of the ancestor of Diplopoda onto the Avalonia terrane that was still attached to Gondwana; lighter arrows represent initial dispersals throughout Avalonia and onto Gondwana proper. At this time, no other land masses harbored millipeds. A, Avalonia; Af, proto-Africa region of Gondwana; B, Baltica; G, Gondwana; K, Kazakhstania; L, Laurentia; S, Siberia; SA, proto-South America region of Gondwana. 4. 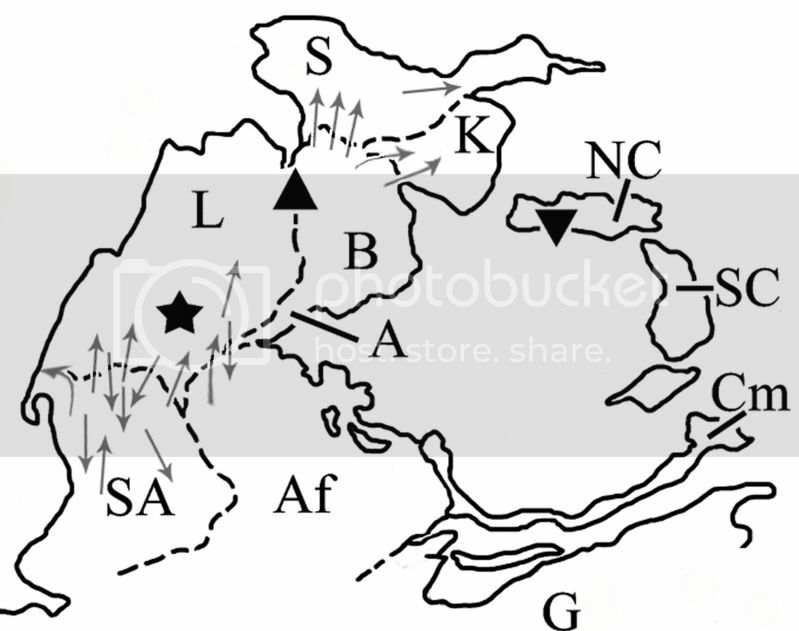 Land masses in Early Silurian Period, Paleozoic Era, 440 mya, after Baltica (B) + Avalonia (A) merged with Laurentia (L) to form Euramerica, thereby allowing ancestral stock on A + B to disperse into L. Dispersions and evolution continued on Gondwana (G), while other land masses were devoid of millipeds. Triangle, future site of Scottish Archidesmus macnioli fossil; Star, future site of US/Illinois oniscomorph pentazonian fossil. 17. 94 ma. Mesozoic, Late Cretaceous. 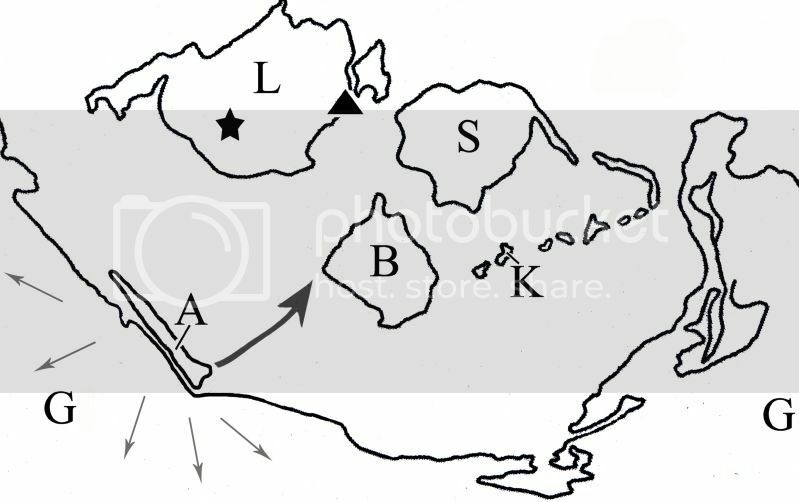 Proto-North American part of western Laurasia completely divided by marine embayment; Glomerida, Platydesmida, Julida, Callipodida partitioned into separate eastern & western populations. Formerly continuous European/ North African populations of Glomerida, Platydesmida, Julida, Chordeumatida partitioned as is continuous stemmiulid fauna through west Africa and eastern Brazil as Africa rifts from South America. Continuous Indian and Madagascan faunas partitioned as land masses split. Continued southeast- and northwestward dispersals on proto-SE Asia part of eastern Laurasia; continued dispersals onto Gondwanan fragments. Spirobolidan, Gobiulus sabulosus fossilizes in proto-Mongolia part of eastern Laurasia. 18. 66 ma. Mesozoic/Late Cretaecous-Cenozoic/Paleocene. Formerly continuous (eastern) North American/European populations of Glomerida, Platydesmida, Julida, Cambalidea, Chordeumatida, Polydesmida partitioned (European Cambalidea becoming extinct in Oligocene). South American populations of Glomeridesmida, Siphonophorida, Spirobolida, Epinannolenidea, Spirostreptidea, Stemmiulida, Polydesmida partitioned between South America and proto-Antilles. 19. 50 ma. Cenozoic, Eocene. After collision generates Himalayan orogeny, faunas of Asia and Indian subcontinent mix; populations of Siphonophorida, Siphonocryptida, etc., become isolated by rise of Himalayas. As embayment fully closes, populations of Julida and Callipodida begin dispersing into and filling void in central North America generating continuous faunas of today and spreading southward into Mexico/ northern Central America. Glomerida, Platydesmida, Polyzoniida, Cambalidea, Chordeumatida, Polydesmida spread southward into Mexico/Central America. Australia + New Guinea split from Antarctica + South America, partitioning formerly continuous fauna. 20. 14 ma. Cenozoic, Late Miocene. Continued dispersals north- and southward of Glomeridesmida, Siphonophorida, Spirobolida, Cambalidea, Chordeumatida, Stemmiulida, Polydesmida in Central America. Antillean Arc fragments, trapping some forms on different individual islands. Antarctica becomes an island after rifting from South America then freezes and glaciates, eradicating all diplopods thereon. Arabian peninsula begins rifting from Africa, thus partitioning continuous spirostreptidean fauna. Formerly continuous East Indian/ Southeast Asian faunas partitioned as Indonesian islands now isolated by water. 20. 14 ma. Cenozoic, Late Miocene.